You are receiving this email because you generously donate to the Pathway to Adventure Council and/or you have opted to receive this e-newsletter. You can unsubscribe at any time by clicking the unsubscribe link at the bottom of this email. 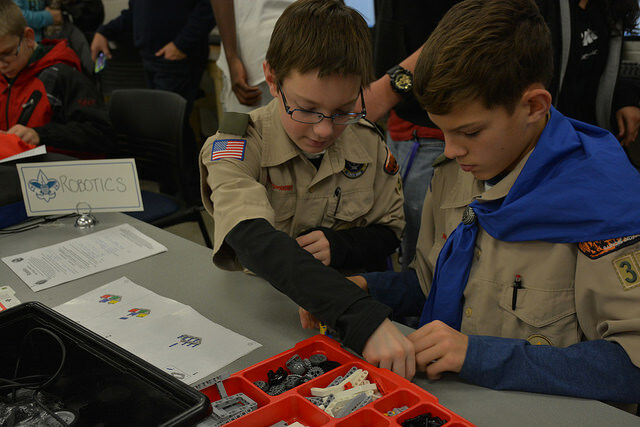 On December 9, 2017 Triton College opened its doors to over 100 Scouts for the opportunity to earn two merit badges, including Automotive Maintenance, Energy, Architecture, Astronomy, Robotics, Space Exploration, and others. The Scouts learned about these challenging subjects by engaging in hands-on activities taught and led by Triton College professors. The Triton Merit Badge College allows Scouts to have exposure to a college environment while earning difficult merit badges. Triton College is looking forward to providing more opportunities like this for youth. The date for the next Triton Merit Badge College will be announced soon! The Annual Youth Recognition Dinner recognizes youth members who have earned the Boy Scout rank of Eagle, the Venturing Summit Award, or the Sea Scout Quartermaster Award. You will not want to this year’s event planned by our National Eagle Scout Association Chapter on March 3 at the University of Illinois at Chicago Forum. The reception begins at 6:00 pm and the dinner is at 7:00 pm. The main highlight of the event is celebrating the accomplishments of the young men and women who have earned the top award in their respective programs. Those attending this year’s event will be in for a special treat as Distinguished Eagle Scout Dr. Michael Manyak, a member of The Explorers Club, will serve as the dinner’s Keynote Speaker. Each youth award recipient being recognized at the event will attend at no cost and receive a unique patch. National Eagle Scout Association members and adult tickets are $150. Registration closes on February 28, so buy your tickets today! For additional information or questions, please contact Dwayne Hunter at dwayne.hunter@scouting.org or at (312) 421-8800, ext. 242. We look forward to seeing you there! Exploring is part of the Boy Scouts of America’s Learning for Life career education program, open to young men and women who have completed the 6 th grade through 20 years old. Exploring’s purpose is to provide experiences to help young people mature and to prepare them to become responsible and caring adults. Exploring is based on a unique and dynamic relationship between youth and the organizations in their communities. The Pathway to Adventure Council ended 2017 with 55 Exploring Posts and 873 youth, a 1% growth over the previous year. Those Exploring Posts include the fields of law enforcement, law, health, aviation, fire and EMS, and engineering. Some of the highlights of the Exploring program in PTAC include having members hold national posts, new posts with the FBI and Customs & Border Patrol, and having an Exploring youth who saved the life of a woman who collapsed on the street. Pathway to Adventure Council is preparing for National’s Vision in 2019. Is your troop going to have the first female Eagle Scout in the Council or even in the Boy Scouts of America? Get ready for success today - create a G.O. Exploring Unit and prepare your future Scouts to learn the basic skills of Scouting as well as the Patrol Method. The future leaders of your troop will be able to test out of skills as soon as they officially join the program in 2019, which will enable them to advance quickly through the ranks to Eagle. We are offering a program for middle school girls to participate in adventures, develop their confidence and leadership skills, make lasting friendships, learn new skills, and have fun. Introducing G.O. Exploring: a unique program for 6th, 7th, and 8th grade girls within the Chicagoland area. G.O. Exploring is an affiliate of the Boy Scouts of America. This relationship provides our G.O. Exploring girls a program with tremendous resources and support to succeed in the future of Scouting. Even cooler? It's just for girls! If you have a 6th, 7th, or 8th grade girl who is interested in the outdoors and would like to be part of a special, innovative group proving the success of girls in the Boy Scouts of America, then we have the program for you! To learn more, email Avery Epstein. Orphaned at age six and afflicted with tuberculosis, James E. West never had much of a childhood. West had to fight for permission to attend school outside of his orphanage— and only if he did his extensive orphanage chores before and after school. Nonetheless, he finished high school in two years, graduating with honors in 1895. By 1901, he’d worked his way through law school and was practicing law in Washington, D.C. In his honor, the Boy Scouts of America created the James E. West Fellowship Award. This gift to a local council, designated by the donor to the council endowment fund, qualifies for membership as a James E. West fellow. The gift must be in addition to— and not replace or diminish—the donor’s annual Friends of Scouting support. A minimum gift of $1,000 in cash or marketable securities qualifies for the Bronze level membership. Donors may make cumulative gifts to reach Silver ($5,000), Gold ($10,000), and Diamond ($25,000) member levels. For example, five years of giving at the Bronze level would qualify for Silver level membership. To apply, please contact Cedric Bodley.